I'd like to tell you how great Brisbane is. River City, Queensland capital, town of many hills, trees, malls, and men wearing walk socks. I'd like to, but I can't, because I really didn't see much of it. I was busy getting Chuckie a nip and tuck. Well, a face lift to be exact. And, ah, a bum lift too. You see, when we bought our truck for our journey around Australia it looked just fine. But when we loaded 72 metric tonnes of junk into the back and on the roof, it rather sagged somewhat. At first I tried to ignore it. But after scraping the rear end over half the motorways in NSW there was no getting around the fact that if the truck bottomed out on the freeway, it probably wasn't going to handle Cape York or the Gibb River Road. So while the girl took in the sights of the fair city, I drove 70km back down the freeway to a suspension specialist who kindly fitted Chuckie was some extra heavy duty rear lift to put a bit of a spring back in his step. Chris, the bloke at the suspension place on the Gold Coast, could only shake his head when I limped in. I explained that we had decided to take the entire contents of a two-bedroom house around the continent. The process of explaining this identified myself as a Kiwi, however, and a half-hour of hilarious jokes followed, mostly involving romantic propositions with sheep. It never ceases to amaze me just how funny Australians think sheep jokes are. Fortunately Chris was better at his day job than he was at stand-up comedy and soon I was heading north to the next appointment, a bull bar fitting in north Brisbane. This involved some 90 km of freeway driving, during which I both sang along to Little River Band's greatest hits to my heart's content and marveled at the difference between NSW and Queensland roads. Seriously, you cross the border and the freeway goes from two lanes to six. Why is it that NSW can't build a four-lane road, I wondered. Probably the same reason it can't make the trains run on time or produce electricity for under $100 a megawatt. Anyway, Chuckie got his nip and tuck, and a shiny new bull bar. So now we're covered if we hit any bulls. So far we've done just over 1300km and we've only been on the road a week. After leaving the isolation of Minnie Water at the end of my previous post we camped a night in Byron Bay, where we paid $A40 for a patch of gravel masquerading as a camp site in the local holiday park. The tea cosy-wearing hippies are still in Byron Bay, but corporate Australia is taking over fast. There's more designer surf shops than you can shake a skateboard at and resort style accommodation is becoming the norm. I love the vibe there, though. 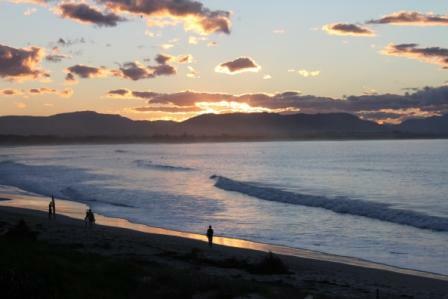 There's something about Byron Bay. It could be its magnificent setting; a wide sweeping bay, a sheltered, safe swimming beach and gorgeous sunrises courtesy of its location as the Australian mainland's most easterly point. Or it could just be that extra-strong double soy latte I had. 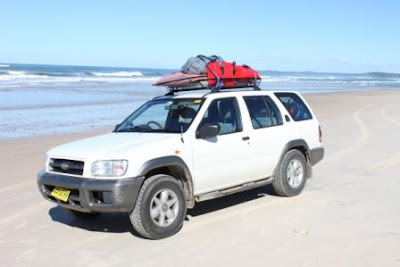 Tomorrow we're headed for Noosa on the Sunshine Coast before tracking up the beach to Rainbow Beach and Fraser Island, the world's largest sand dune apparently. Fraser Island sounds pretty cool. It's the only sand dune in the world that supports a rain forest. It's also something like 100km long. The entire place is accessible only by 4WD (and a boat, obviously) and the Queensland parks service operates camp grounds around the island. We've booked one for the princely sum of $A10 a night. I'm a little nervous about driving on the beach, having heard all the horror stories about getting stuck as the tide's coming in. But it also sounds like a whole lotta fun. I thought after that we'd pop up the road to Cairns, which I figured would only take a day or two until I realised it was 1700km north of Brisbane. Australia is a seriously big country. Hi Colin, Hope you're having a great time! Fraser Island is amazing - take photos and watch for those march flies, they sting you. Look out for a dingo - you might get lucky to see one too!